Going for Gold–available August 31, 2012! I ask because I am so excited about the release of Going for Gold, the Olympic-themed M/M anthology from MLR Press. I can’t remember when I was this excited about a new release! 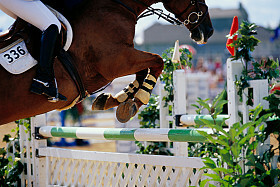 Maybe it’s because the subject matter in my story is one dear to my heart–the horse sport known as Eventing. Maybe it’s because there are six other great stories in this anthology and I can’t wait to read them! Maybe it’s because I barely got a chance to watch the London Games this year and already I am in serious Olympics withdrawal. I did get to see some of the Beach Volleyball, the swimming, and the platform diving. Matthew Mitcham is my new hero, let me tell you. 🙂 Oh, the drama of the women’s gymnastics! Or how about GB ending a sixty year drought by winning gold in the show jumping? I still have the equestrian events on TiVo because I have plans for the characters in my anthology story, Lightning in a Bottle. *rubs hands together evilly* I had eyes on the ground, too, as my good friend and fellow author Claire Russett was on hand to watch the dressage portion of the eventing competition (and report back to me). Michael P. Thomas talks about how he deals with his own Olympic withdrawal symptoms here. His video clip of Matthew Mitcham is a must-see for everyone! I’m off to a horse trial this weekend (sadly, not as a competitor this time) so be prepared to be inundated with horse pictures on my return. Gotta love a profession where everything can be written off to research, eh? There will be more author links as blog posts go live, so be sure to check them out! So what’s your favorite Olympic sport? Is it the diving (one of mine!)? Do you love seeing how happy the swim teams are? What’s the draw for you? The competition? Watching top athletes at peak performance? All that lean muscle and exquisite display of the human form? What do you wish they’d show more of–or less? Inquiring minds want to know. Share! This entry was posted in Uncategorized and tagged eventing, Going for Gold, MLR Press, Sarah Madison, swimming. diving, writing by Sarah Madison. Bookmark the permalink. My favorites are (surprise surprise) the water sports. 🙂 Diving definitely, but pretty much all of the water stuff from the swimming relays to water polo. Track & Field also piqued my interest this year with Oscar Pistorius’s races. He’s such an inspiring athlete.